Where Is Best To Shop For Wine? As you all know I am getting married and we have been looking at ways to save money on our big day, one thing we have been thinking of is buying wine online to save money rather than ending up with a huge drinks bill. Buying wine online is great, you can get an enormous variety of wines delivered straight to your front door, all without having to leave the comfort of your home. However, it can be difficult to know what sites are the best for buying wine. Which companies offer the best value for money, and which have the best delivery services? Should you buy from a supermarket like Asda or Aldi, or from a dedicated wine retailer such as Naked Wine? These were the questions asked by members of winesdirect.com, and the site responded by creating an annual awards competition to reveal which retailers are the best for buying wine. The surveys were sent out in the Spring of 2017 to members of the site, and now the results are in. The first thing to look at is how popular different retailers are among wine consumers. Of the 1200 people who responded to the survey, a massive 29.5% choose to use Tesco Wine By the Case, with the runner-up being Asda Wine with 24.8% of the vote. This means that these two wine retailers alone constitute almost half of the vote!. Other popular retailers were Sainsbury's, Majestic Wine, and M&S. Some of the least common choices were Aldi Wine, Ocado, and Virgin Wines. However, as we can see, where people choose to buy does not always correlate with what they think is best. The first award to discuss is the Value for Money award. The silver medal was won by Asda Wine, while the gold medal went to Aldi Wine. This implies that either of these brands would be a great choice for a budget-conscious wine consumer, and also that in the area of value for money, supermarket wines tend to perform better than dedicated wine retailers. When purchasing wine, customers also want fantastic customer service. The silver medal for customer service was won by M&S wine, while Laithwaite's got the gold medal. This means that if customer service is very important to you, or perhaps you want advice on which wines to buy, you should consider trying M&S or Laithwaite's for your wine. Also important when choosing a wine is a large selection of different varieties. Laithwaite's also managed to grab the silver medal in the Wine Range category, while the gold went to Waitrose Cellar. Therefore, if you want to be able to choose from the biggest range of wines, or are looking for something a bit unusual, either of these retailers would be an excellent choice. Some people enjoy having wine delivered, and so Wines Direct created the Delivery category to highlight the retailers offering the best delivery service. In this category, Ocado got the silver medal while the gold was awarded to Naked Wines, meaning that if you want your wine delivered it is worth looking at these two. 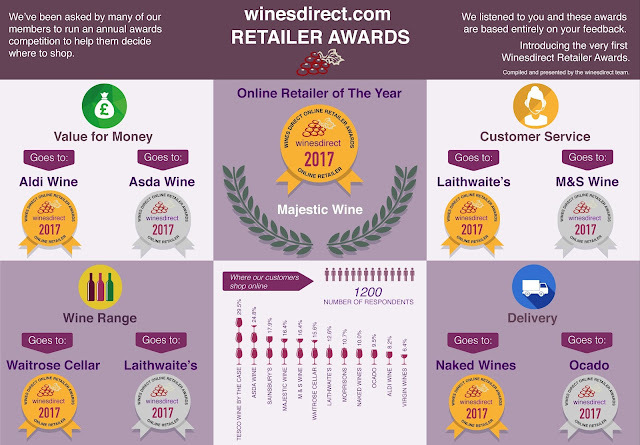 However, the overall Online Retailer of the Year award was awarded to the specialist retailer Majestic Wine, despite the fact they did not win in the other categories. This seems to imply they are a great all-rounder with lots to recommend them in all categories. On the whole, there are a lot of fantastic wine retailers out there, and these awards can help you in deciding where to buy your wine, depending on what factors you value. Where do you buy wine? I would love to know in the comments below.